On May 12, the newest generation of dedicated NC State College of Veterinary Medicine students will officially become the newest generation of dedicated veterinarians. As we head into the big day, we asked Class of 2017 students to share in their own words what their CVM experience has meant to them: the ups, the downs, the experiences, the memories that won’t likely fade away. Throughout this week, up through graduation day, we will share six of their stories with you. Here is the first. I had a tough first year. I am a first generation college student from a small town. The move to Raleigh and the transition from working full time to being back in the classroom all day was difficult. But all of the faculty and staff were there to help me through the ups and downs. I was diagnosed with a learning disorder and the school community helped me find ways to adjust so that I could still succeed. I am proud to be a member of such a supportive Pack. There are just so many people who have had an impact on my education that I can’t list them all. Dr. Gigi Davidson gave me a job during the summer that not only allowed me to support myself but also continue learning about veterinary medicine in the process. Dr. Korinn Saker was a great mentor during my sophomore year. She taught me a lot about nutrition and research. I was working in her lab on my birthday and she surprised me with a cake she had baked. 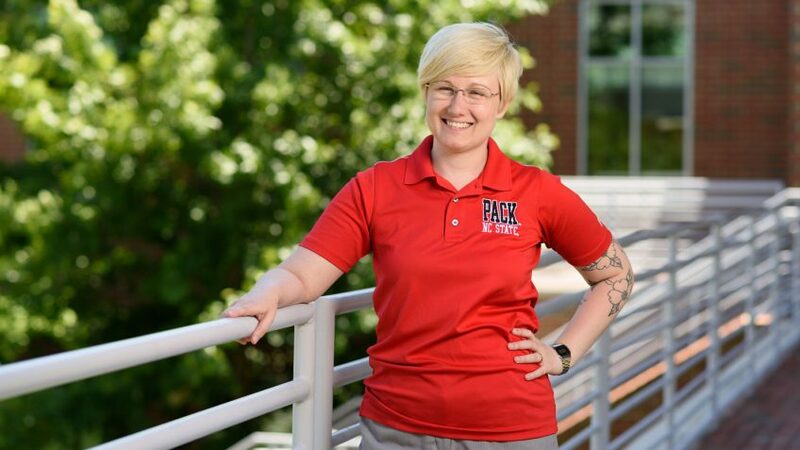 At NC State, the teachers are more than just professors — they are great colleagues. Dr. Mathew Gerard was such an asset to my education. During first-year anatomy I was having a really difficult time learning all of the different structures. He went out of his way to help myself and other students by scheduling tutoring sessions and making extra presentations. At NC State, the professors are dedicated to your education. The CVM community is way more than just veterinarians. Here, there are so many great professionals in related fields to learn from. Veterinary school is hard work but it is very rewarding. Get your hands on as many animals as you can so that you can relate the information you learn in class to the real world. Don’t be afraid to ask for help or admit you are not sure about something. We are here to learn and everyone at NC State wants to see you succeed. You are part of a great community and have access to amazing resources during your time here — use them!